It was only two and a half years ago that local Watford City Veterinarian Dr. Bruce Pedersen was listing his major goals when he first started practicing veterinary medicine in Watford City. One of his goals was to incorporate technology into his business so that it could help him better communicate and educate his clients. But his second goal was to eventually expand his practice. Needless to say, in addition to taking one patient at a time and providing the best practice possible, all of his major goals have now been accomplished. His new facility has not only allowed for an increase in space, but the addition of new technology and equipment to better serve his clients and their animals. It was through the generosity of the Watford City Livestock Association donating the land for the new facility, that reaching this milestone was possible for Pedersen, his staff, and the community. With the rapid growth over recent years in the Bakken, came the expanding need for veterinary services. It is Pedersen’s continued hope to play a key role in this community, and to be able to preserve and maintain that special bond with the opening of his new facility. The new facility was designed with Pedersen’s clients in mind. Back in the fall of 2014, Heather Pedersen, Dr. Pedersen’s wife, started reaching out to various community members, obtaining their permission to rummage through their old tear-down, wood and scrap materials. The more rusty and old an item was, the better. Two full months were spent planning, calling, collecting, refurbishing, and re-purposing these ancient pieces of history. Pieces of history that now adorn and hang throughout the facility showcasing and representing the strong community ties held by the people of Watford City – pieces that the Pedersens preserved to show respect and admiration for this area’s history. Of all the veterinary clinics in North Dakota, Pedersen’s new facility is the biggest, and it is the third largest in the nation. Currently, the clinic has a staff of 14, including three veterinarians and two relief veterinarians. The staff at Pedersen’s clinic has extensive experience in small and large animal care, surgery, emergency medicine, dermatology, oncology, internal medicine, and advanced procedures. The Watford City Veterinary Center is a full-service veterinary facility providing the greater McKenzie County area with medical, surgical, behavioral, and other veterinary-related care for both large and small animals since 1967. Originally founded by Dr. Robert Nelson, then transferred to Dr. Pedersen in 2012, the “clinic” turned to “center” when the brand new facility was built in 2014. The new center offers a mixed use animal hospital that blends modern medicine and technology with old-fashioned care. It is a three-level entity carefully designed to optimally serve the needs of the community and to provide excellent care to the animals they love. The list of services offered is extensive. Services include food, animal and livestock services, small animal medicine and surgery, acupuncture, dentistry, 24/7 emergency care, wellness exams, and healthcare services, boarding, pet spa, diagnostic imaging, education, and telemedicine, pharmacy and retail, and euthanasia, funeral, and cremation services. In the very near future, the center will be opening its first crematorium. Currently, clients have a four to five-week turnaround time and everything goes to Williston. However, once open, the community will have access right in their backyard without the wait time. “The moral of the story is that I think it’s going to help us increase the quality of care and of life for not only our clients and their pets, but their families as well,” said Watford City Associate Veterinarian Dr. Seth Nienhueser with regards to the new facility. In addition to the multitude of services offered to both small and large animals at the new facility, the Watford City Veterinary Center will act as a teaching hospital for students, interns, and individuals with a passion to learn and work in the field of veterinary medicine. And those interested students and individuals that come will be welcomed into a very family-oriented environment. 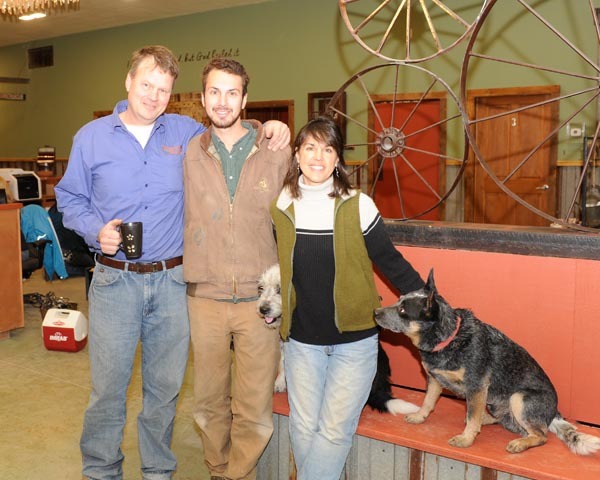 When Pedersen stated a couple of years ago that he wanted his clinic to be the ‘Mayo Clinic’ of veterinary medicine, unbeknownst to him, he would eventually see the day his clinic would finally transition into just that – a veterinary center held with such high regard and respect. The opening of this state-of-the-art facility has become a dream come true for this Watford City veterinarian. A love and passion that started out in a young man has continued to grow and evolve into the prestigious career of a doctor.